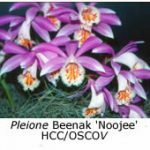 Pleiones (pronounced plea-own-ease) are native orchids found in the mountains of the Himalayas, southern China and Taiwan. Most species enjoy cool conditions and are suited to cultivation in a cool semi-shaded location in Melbourne gardens. 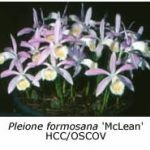 Pleiones are annual plants, dying down in late autumn to leave one or more bulbs; these remain dormant until early spring, when the new growth begins. The flower spike also appears at this time, emerging from the centre of the new growth. The single flower (occasionally two) matures in a few weeks and lasts two or three weeks if kept dry. The plants must then be watered and fertilised regularly to develop the large bulbs needed to produce next year’s flowers. 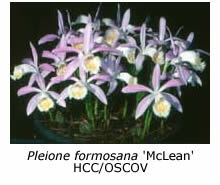 Pleiones are best re-potted during the dormant season (June-August). Take the newly grown tubers and carefully remove and discard the old, withered, dark tubers that produced their flowers last year. Be careful not to damage the new growths at the base of the new tubers. Cut the roots back to a length of 30-50 mm and re-pot in a mix comprising fine pine bark, chopped Sphagnum moss and gravel in the proportions 5:2:1 (by volume). A little pelletised fowl manure (e.g. Dynamic Lifter®) may be incorporated in the mix. Then plant the tubers to about two-thirds of their depth in the mix, using pots that are 125 mm or more in diameter, depending on the number of tubers. Pleiones enjoy filtered sunlight (70% shade cloth gives good results), cool temperatures and plenty of air movement (but not hot, dry north winds). They grow best near the ground in a shade house where temperatures are lowest and humidity highest. 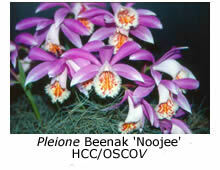 Pleiones grow best if watered regularly during their growth cycle. Never allow the pots to become completely dry. During heat waves never water during the heat of the day – water either early in the morning or wait until temperatures have fallen in late evening. Regular application of liquid fertilisers (e.g. Aquasol®) helps to develop large leaves, which in turn leads to the large tubers necessary for good flower production next season. Apply the fertiliser at half the manufacturer’s recommendation every two or three weeks between October and April. Stop fertilising and reduce the frequency of watering when the leaves turn brown and fall in late autumn.